This lovely and beautiful Peach Morganite Round Cut Diamond Channel Inlaid Ladies Ring is expertly crafted in 14K Rose Gold. A beautiful elegant piece. 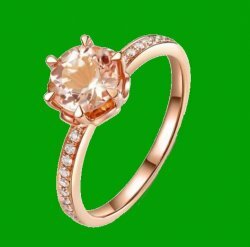 Pretty, enjoy this Peach Morganite Round Cut Ring. Each ring features One (1) Round Cut genuine Peach Morganite Gemstone measuring 7.00mm in diameter . The gold metal weight of this pendant is 2.95 grams. The stone weight of the Peach Morganite and Diamonds is 1.347 carats. This Ring is also available in 14K Yellow and White Gold, 18K Yellow, White and Rose Gold, please see the drop down menu my other listings in store for pricing and details.